On November 27, 2017, the European Commission published its final Regulatory Technical Standards (RTS) on Strong Customer Authentication (SCA) and Common and Secure Communication (CSC) under PSD2. With the release of the final PSD2 RTS requirements, banks of all sizes can now take action to develop a compliance strategy and implement effective security solutions for electronic remote payment transactions. The Revised Payment Services Directive, known as PSD2, harmonizes security requirements for online banking and online payments, providing a common regulatory framework for the EU. The security requirements in the final RTS are driven by two core objectives of PSD2: protect consumers from fraud by increasing payments security, and enhance competition and innovation in the retail payments market. On December 5, Frederik Mennes, PSD2 expert and Sr. Manager, Market & Security Strategy at OneSpan presented a webinar entitled: PSD2: Are you ready for the long-awaited final RTS? Article 97 of PSD2 requires Payment Service Providers to authenticate a user when they access an online payment account, initiate an electronic payment transaction, or carry out any action through a remote channel that may imply a risk of payment fraud. 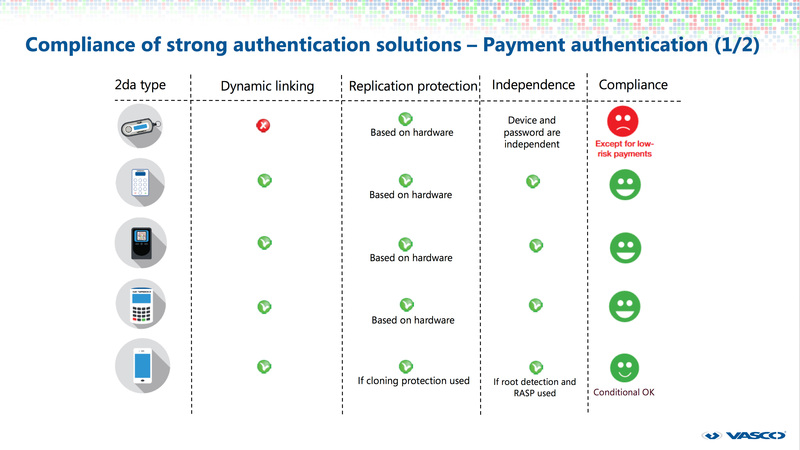 Watch our webinar to learn which categories of authentication solutions meet these requirements. Audits. Audits of security measures of Payment Service Providers (PSPs) must be carried out by an auditor with expertise in IT Security and payments, and that is operationally independent within or from the PSP. Watch this free OneSpan webinar to understand the significant impact of the final RTS on the way banks and Payment Service Providers authenticate their customers. Out-of-band. The possession element is the mobile phone where the user receives authentication codes. The knowledge of inherence element is entered onto the banking device (for two-device authentication) or mobile device (for two-app or one-app authentication). Transaction risk analysis is mandatory, even when strong customer authentication is used. Transaction risk analysis can be used to exempt a subject from the need to perform SCA. However, this exemption is subject to a several corresponding conditions. All banks operating in the EU, including retail and corporate entities, are subject to compliance. The RTS (including authentication requirements) will become applicable in August or September 2019. It’s important to recognize that the RTS are technology and business-model neutral. Because the RTS is a legal text and not technical or prescriptive, it can be interpreted in any number of ways by any number of institutions. With so much on the line legally and financially, the real question becomes how to build the most effective strategy for compliance. If you are a line of business owner managing service and delivery channels in the bank, an IT leader responsible for implementing security in these channels, or an in-house legal expert, watch the webinar for expert insights on how to interpret the standards and comply with the final PSD2 RTS requirements.